In the summer of 2015, the Wortgarten Festival (i.e. Garden of Words Festival) was held for the first time near Fürstenwerder in the Uckermark region. This summer literature festival of a rather different kind showed alternative ways in which to bring literature to the people. The Uckermark region, often described as a “sparsely populated area roughly 150 kilometres north-east of Berlin”, suddenly became the focus of literary attention in 2014 when the author Saša Stanišić won the Leipzig Book Fair Prize for his novel Vor dem Fest. Weird and original characters – not only those who lost out as a result of German reunification but also people who have chosen to move to the area – populate the novel. Stanišić’s Fürstenfelde, the setting for Vor dem Fest, is modelled on Fürstenwerder, a village in which he himself lived for a time. 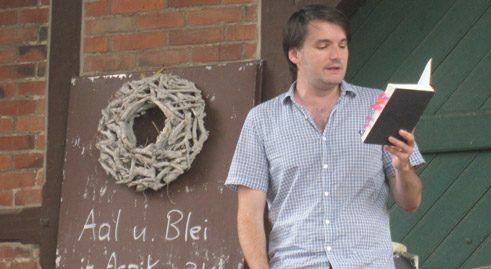 When Saša Stanišić invited visitors to take a literary stroll through his former home of Fürstenwerder at the start of the Wortgarten Festival, more than 100 fans of literature were only too happy to accept. Feeding them a lively mixture of facts and fiction, Stanišić took them from place to place, his audience hanging on his every word. This already was an indication that Wortgarten would not simply be the same as any other festival. Its organizers from the Verein Kook in Berlin’s independent scene were lucky enough to find patrons in the form of Detlev Graf von Schwerin and his wife Kerrin who were willing to provide a unique setting for this summer festival of literature and music at Bülowssiege, their estate near Fürstenwerder in the Uckermark region. 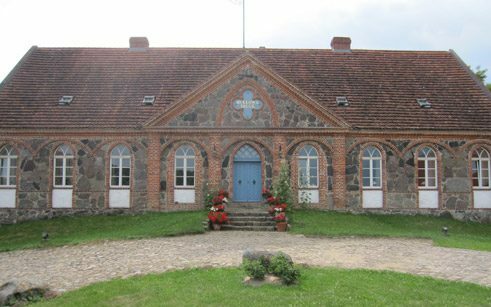 Following two periods of dictatorship, this estate from the German romantic period – a real insider’s secret – is now in family ownership again. Bülowssiege was named after Friedrich Wilhelm Freiherr von Bülow, a successful general in the “Wars of Liberation“ against France in the years 1813 to 1815. The festival was even lucky with the weather: while an area less than 100 kilometres away was battered by severe storms, more than 500 visitors thronged to the open-air readings in the park and grounds of the estate. Authors from the local region cheerfully took turns with more cosmopolitan writers, while a special programme for children – where else would one find such a thing? – provided non-stop fun. None of the children left the festival without a copy of Cowboy Klaus in their rucksacks. Karsten Teich and Eva Muszynski, the authors of this series of books for early readers, had done a really great job. Bülowssiege estate | Photo (detail): Bernd Zabel Indeed, the line-up of authors presented throughout this long and highly entertaining weekend by Verena Auffermann (literary critic), Jörg Sundermeier (publisher at Verbrecher-Verlag Berlin) and Daniel Beskos (publisher at Mairisch-Verlag Hamburg) was truly wonderful: Oliver Bottini, Georg Klein, Katja Lange-Müller, Tilmann Rammstedt, Kathrin Schmidt, Ingo Schulze, Jan Wagner, Kirsten Fuchs and Annett Gröschner, not to mention the newcomers Karen Köhler, Daniela Seel and Karla Reimert. Alongside Karsten Teich and Eva Muszynski, Finn-Ole Heinrich and Jan Peter Bremer made up the quartet of children’s book authors. Rather than showcasing their greatest successes, the authors presented insights into their work, together with shorter new texts, excerpts from novels and thrilling reportage. All of this was interspersed with delightful music: the strange and humorous songs of singer-songwriter Jan Böttcher, plus sophisticated pop music in the evenings courtesy of Mascha Qrella and her band. Visitors camped out in the neatly-clipped grass, seeking the shade of the fruit trees. Individuals – namely the authors – would detach themselves from the groups to give a reading and then return. It is rare to find such close proximity between authors and audience, which was partly thanks to the setting: the upbeat summer atmosphere gave rise to discussions which lasted well into the night. It is interesting to note that there were no booksellers or event agencies involved, the festival having been curated and organized by the artists Jutta Büchter, Lucy Fricke, Alexander Gums from the Verein Kook and their helpers themselves. It was also great that the encounter was made possible by the German Federal Cultural Foundation, the Rudolf-August-Oetker-Stiftung and the Ostdeutsche Sparkassen-Stiftung. In conclusion, there should be more events of this kind – ones that are as barrier-free as they are profit-free, but which create communities. If there were, there would be no need to worry about keeping contemporary literature alive. Bernd Zabel is head of the “Literature and Promotion of Translation” department at the Goethe-Institut.